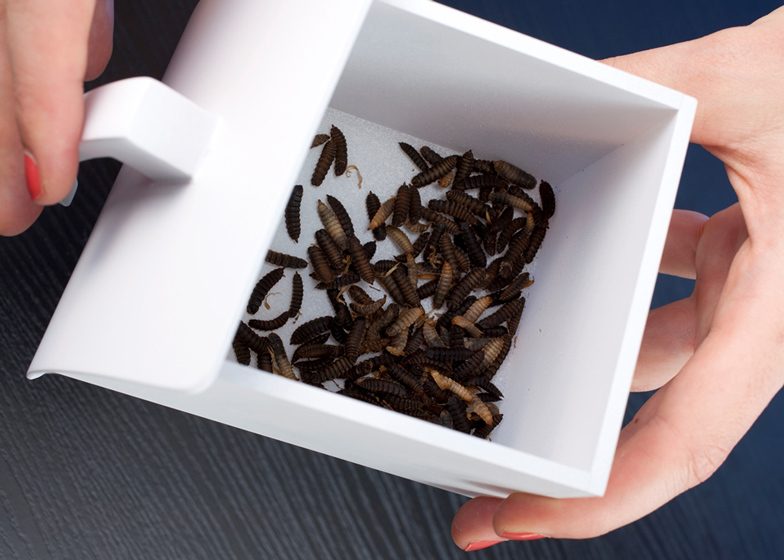 Graduate designer Katharina Unger has designed a table-top insect breeding farm that allows people to produce edible fly larvae in their homes (+ slideshow). "Farm 432 enables people to turn against the dysfunctional system of current meat production by growing their own protein source," said Unger. 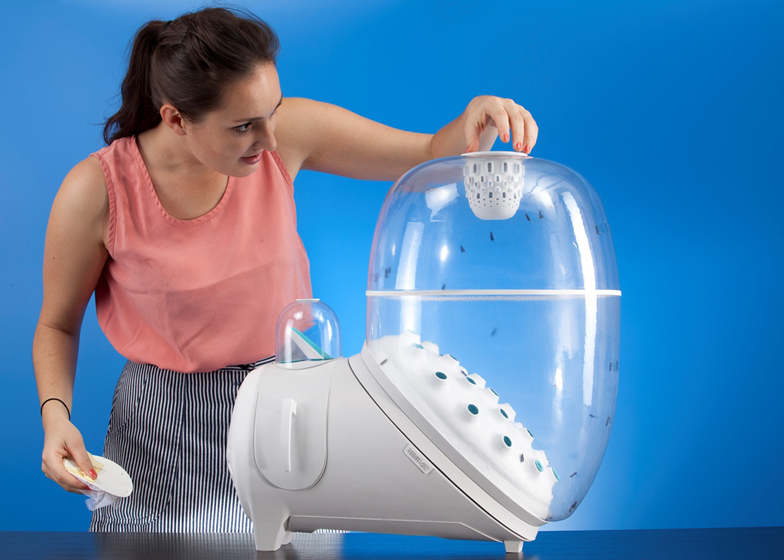 As part of the project, she bred and ate black soldier fly larvae in a prototype system, then designed a machine to replicate the process on a domestic scale. 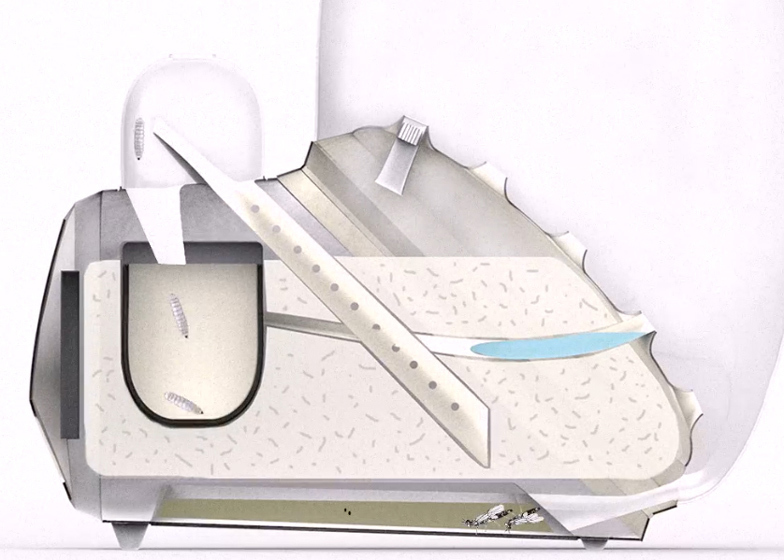 "I ordered larvae and built up my own fly colony to see if the process works," she told Dezeen. "It was very exciting to watch the larvae migrating up the ramp, new flies emerging, mating and laying eggs." In her design for the farm, soldier fly larvae are dropped into a chamber at the top of the appliance, where they develop into adult flies and move to a larger chamber. Here they mate and produce larvae, which fall down into a "kindergarten" area, mature and become trapped in a harvesting pot, ready for consumption. A few of the harvested larvae are selected to be dropped back into the top of the machine and start the cycle again. "Black soldier fly larvae are one of the most efficient protein converters in insects, containing up to 42% of protein, a lot of calcium and amino acids," the designer adds. After 432 hours, 1 gram of black soldier fly eggs turns into 2.4 kilograms of larvae protein, so Unger predicts that people could harvest approximately 500 grams of larvae a week, producing two meals. "The larvae I bred have a very distinctive taste," she told us. "When you cook them, they smell a bit like cooked potatoes. The consistency is a bit harder on the outside and like soft meat on the inside. The taste is nutty and a bit meaty." 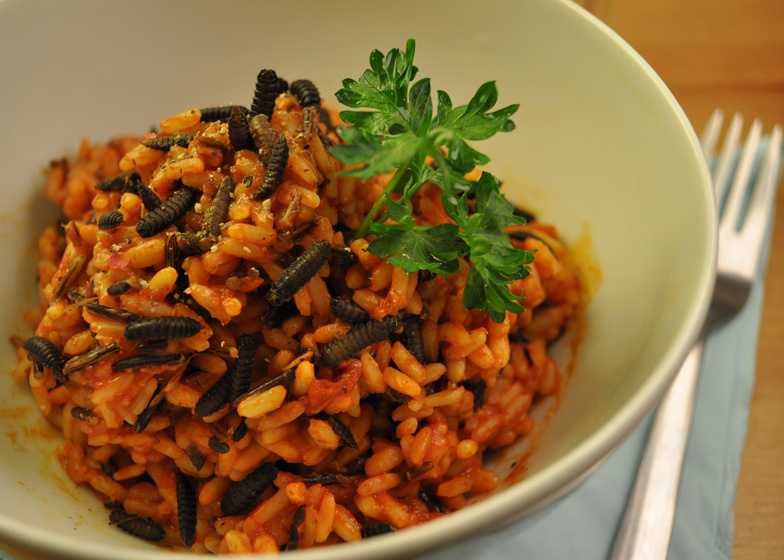 Her favourite recipe with the insects so far is larvae and tomato risotto: "I like to mix parboiled rice with wild rice together with the larvae, put a lot of tomato sauce in it and a bit of parmesan cheese. A bit of parsley or basil on top and you have a perfect meal." "With my design I am proposing a new lifestyle," the designer told Dezeen. "It's about a potential new western culture of insect eating and breeding... It is really about making people see that there is a great variety of food on our planet that we rarely consider." Unger explained that by 2050 meat production will need to increase by 50 percent to meet population increase, predicting that because we already use one third of croplands for the production of animal feed, it will be necessary to develop alternative food sources and production methods. She added that her system so far uses just one out of 1000 edible insects in the world and she wants to develop the idea further in collaborations with manufacturers and researchers. Unger completed the project whilst studying Industrial Design at the University of Applied Arts Vienna, and was taught by Hartmut Esslinger of Frog and Fiona Raby of Dunne & Raby.